One of my ambitions has always been to take a voyage beyond the Arctic Circle in search of the elusive aurora borealis, or Northern Lights. For years I have been fascinated by the mythology of the lights and the stories about them that have been preserved in the folklore of the Sami and other peoples dwelling in the polar regions. NASA scientists predicted solar maximum activity would reach a peak during the winter of 2013-14 and next winter. This is providing travellers to the far north with an opportunity to observe some spectacular auroral displays. This was too good an opportunity to miss so on 7 January, accompanied by my wife and fellow journalist Carolyn Waudby, we flew to Bergen to join the MS Midnatsol, the largest and newest ship in the Hurtigruten fleet. Since 1893 Hurtigruten (‘the express route’) have provided a daily passenger and freight service for communities along Norway’s long and spectacular coastline. The celebrated journey north -visiting tiny ports and large cities like Trondheim and Tromso – provides an unrivalled vantage point to see the aurora away from artificial lights, and to collect stories and folklore along the route. Coincidentally, on the very day we left the UK the popular BBC2 series Stargazing Live, presented by Brian Cox and Dara O’Briain, featured an item on the northern lights filmed from an aircraft flying above Tromso, the capital of the Arctic. With interest in the aurora at an all time high, we kept our fingers crossed and hoped we would be lucky enough to see them for ourselves. From Bergen we began a seven-day cruise that took us north beyond the Arctic Circle at 71 degrees north, through the Loften Islands and past Nordkapp (the North Cape) – the most northerly point in Europe – to Kirkenes, on the border with Russia. Along the way we visited a medieval cathedral and a hotel made from ice, saw sea eagles swooping on their prey, ate freshly-caught king crabs, joined a dog-sledding expedition across a snowy hillside and, best of all, were fortunate to witness displays of the aurora from the deck of the MS Midnatsol on two occasions. 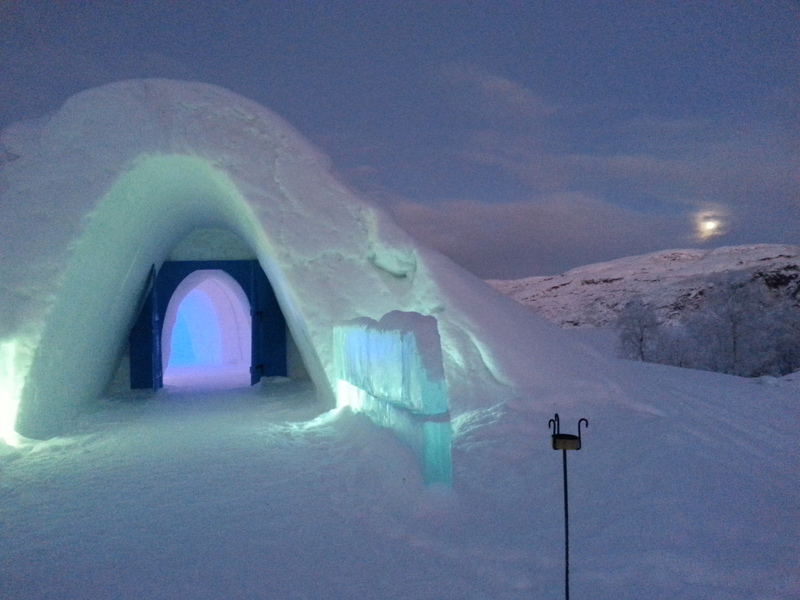 The Snow Hotel near Kirkenes near the border between Norway and Russia. After several nights of murky weather we had begun to wonder if we would see the celebrated natural wonder. 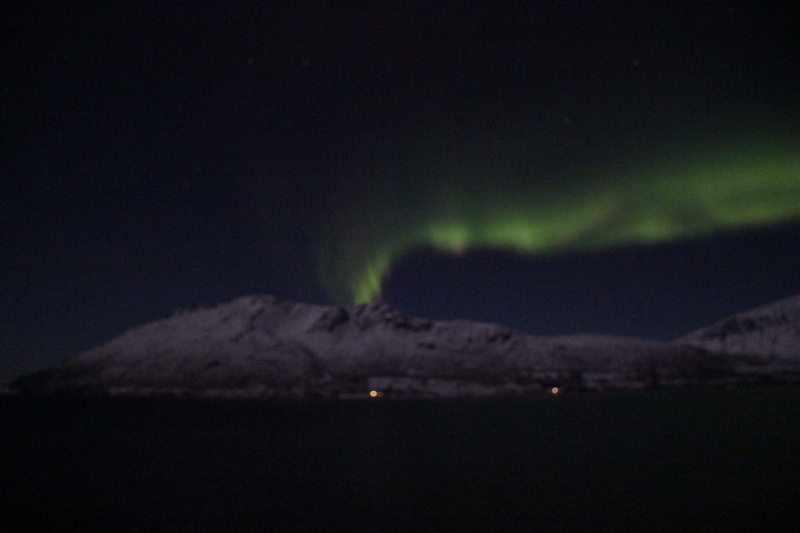 But when the Midnatsol left Tromso on Saturday 11 January the skies had cleared. The solar activity readings from the city’s Geophysical Observatory looked promising. Everything was set and we were not to be disappointed. Ten miles north of the city we saw what resembled a volcanic eruption emerge from behind a snowy hillside to our starboard. An eerie streamer of auroral light seemed to rise from the sky, dropping chiffon-like curtains along a line that arched above and beyond the northern horizon. Several hundred passengers crowded onto the upper decks of the ship to take in the majestic vision that unfolded in the sky until the lights faded from view 40 minutes later. Obtaining a good photograph of the aurora is not straightforward, but patience, warm weather gear and access to a good digital SLR camera and tripod helps. Fortunately, Hurtigruten provide everything you could possibly need for a successful ‘light-hunting’ expedition. Everything from tips on photography to presentations on the science and mythology of the aurora are included in the itinerary. The crew will even broadcast their arrival over the ship’s loudspeakers if alerted to their presence in the night! We sailed with the MS Midnatsol for a 6-night/7 day voyage, overnighting at the Thon Hotel in Kirkenes, just 7 km from the border with Russia. From here, we flew back to Manchester, having enjoyed an unforgettable and amazing journey. It is possible to stay on your ship for the return journey south to Bergen, a round trip of 12 days in all. But with ships sailing from every port twice a day, the programme is very flexible and with a bit of forward planning it is possible to construct your own tailor-made light-hunting expedition. A fuller account of our journey and the places we visited will appear in the travel supplement of the Sheffield Star. The folklore and mythology of the aurora borealis will be the theme of a Fortean Traveller feature in a future issue of Fortean Times. *Full details of the Hurtigruten coastal programme – that includes explorer voyages to Spitzbergen, Greenland and the Antarctic – can be found on the company’s website here. This entry was posted in Uncategorized and tagged 11 year sunspot cycle, aurora borealis, BBC Stargazing Live, Bergen, Brian Cox, Carolyn Waudby, Dara O'Briain, dog-sledding, folklore, Fortean Times, Hurtigruten, king crabs, Kirkenes, Lofoten Islands, MS Midnatsol, NASA, Nordkapp, Northern Lights, Norway, Russia, Sami people, sea eagles, Sheffield Star, Thon Hotels, Tromso, Trondheim. Bookmark the permalink.